Elegantes Blogger Template is a beautiful responsive theme created for Fashion, Travel, Lifestyle and Food bloggers. 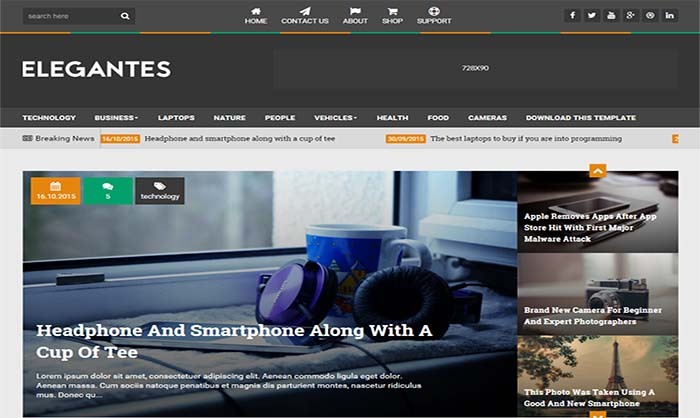 Designed with readability in mind, Elegantes highlights what’s important in your content. Its clean lines, excellent typography and efficient use of space make your blog a pleasure to read and browse. Equipped with a host of useful features, Elegantes takes blogging to a whole new level. All of this is enabled by a robust and extensively tested code. If that wasn’t enough, our efficient, effective and timely support system makes sure that you focus only on what’s important.